Dr. Eaves received his BS from the College of William & Mary. He then earned his MS from Michigan State and his EdD from the University of North Carolina at Greensboro. Dr. Eaves teaches Biomechanics of Human Movement and Human Anatomy, as well as Human Physiology and Exercise Physiology. 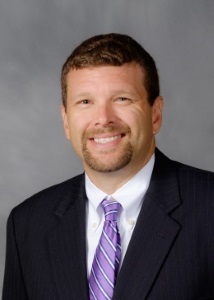 Dr. Eaves has authored the textbook The Practical Guide to Athletic Training, and his research interests include the use of spit tobacco in high school baseball coaches. Eaves, T. & Strack, R.W. (2014). Spit Tobacco Use in High School Baseball Coaches: Prevalence and Implications for Intervention. Applied Research in Coaching and Athletics Annual, 29, 259-273. Eaves, T. & Strack, R.W. (2013). Factors Affecting High School Baseball Coaches’ Enforcement of School Tobacco Policy. Journal of Child and Adolescent Substance Abuse, 24(2), 125-130. Eaves, T. (2011). The Relationship between Spit Tobacco and Baseball. Journal of Sport and Social Issues, 35(4), 437-442.